The sauna is an essential part of the finish culture and national identity. Public saunas used to be common in all the big cities, however since most new apartments have a sauna of their own, the number of public saunas has decreased drastically. Several public saunas are now being planned to recreate the sense of community in the new urban areas, in addition tourists will get an authentic Finish sauna experience. Löyly was initiated by the city of Helsinki. The sauna is located at a former industrial area, and is part of the plan to develop the place into a residential area with more activity. Avanto Architects was given the honor to design the new attraction. It's a simple idea, they say: there is a rectangular black box containing the warm spaces and is covered with a free form wooden cloak. The sculptural structure made out of heat treated pine has several functions—it gives people privacy, shades the interior spaces and helps to reduce the use of energy to cool the building, in addition it protects the building from the harsh costal climate. 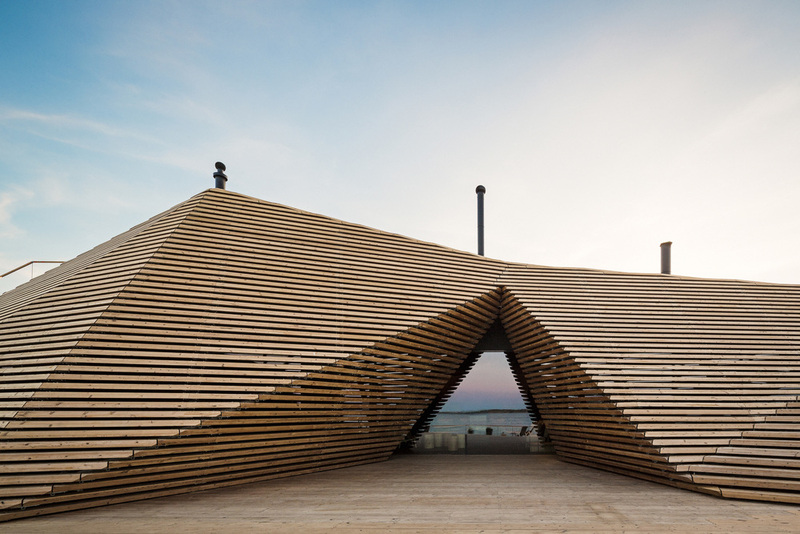 Inside you find public saunas, a spa and a restaurant, designed by interior architect Joanna Laajisto Creative Studio. The ambition was to design an atmosphere in the restaurant that compliments the strong architecture of the building. Black concrete, light Scandinavian birch wood, blackened steel and wool are the main materials, all durable and long lasting.